Breathtaking scenery viewed from on high. Don't miss the once-in-a-lifetime opportunity to ascend to the thick green forest canopy and see Costa Rica's jungle life from a perspective once available to only a select few researchers and photographers. This is an adventure for all ages! There are two ways to enjoy a trip into the sun-glittering treetops: canopy walk and zip line. Choose one… or BOTH! Many outfitters offer both options, and even some additional attractions like butterfly gardens and serpentariums, so you can play all day. Although canopy tours and zip lines are available across Costa Rica, Monteverde (in the heart of a famous cloud forest) and Manuel Antonio (in the monkey-filled rainforest) are the most popular places in the country for these activities. Take a peaceful walk among the leaves. 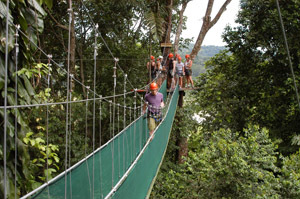 Canopy walks usually consist of well-built catwalks, secure platforms and swinging bridges hung high in the trees. There is no better place for bird-watching! Most of Costa Rica's nearly 900 bird species spend their time above the ground. Many can be seen from the canopy. Take a guided tour if you want a naturalist to point out the area's highlights. Or simply meander, looking for animals and basking in the energy of nature. Nothing short of exhilarating! If you are a more adventurous tourist, you can swing like a monkey through the trees on a one of Costa Rica's heart-stopping zip lines. Since its introduction in the 1970s, zip lining has become one of Costa Rica's most popular activities. After donning a special harness and helmet, you will climb to the facility's highest platform. There you will be attached to a steel cable system and sent "zipping" down a from platform to platform. What an adrenaline-pumping thrill! The only thing you have to bring is your courage. The best companies provide professional guides with many years experience and all the gear to keep you safe and comfortable. As more and more platforms and zip lines are constructed in pristine forests, there are concerns that these "eco-tours" may not remain so ecologically sound. Or safe. Visitors are advised to visit only well-established facilities. 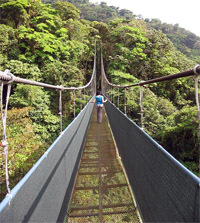 Again, the companies listed in Monteverde and Manuel Antonio are most popular. See our map of Costa Rica. Also see more things to do and find the best Costa Rica attractions. Experience Costa Rica's remote wilderness in a truly extraordinary way.